Transport plays an important role in the economy and social development in the country, hence the importance of education and schools development in the transport sector—and when it comes to growing our economy, the role of training and skills development in the sector should not be underestimated. “The transport sector is not a local sector, it is a sector that is connected to what is happening across the globe, and therefore it is a highly competitive and highly regulated sector. 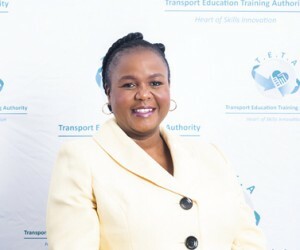 Any country that does not have the right skills would not be able to compete, compared to those that have skills—and transport skills development and education is extremely important for a variety of reasons.This is the opinion of Maphelo Anno-Frempong, CEO of the Transport Education Training Authority (TETA ), whose entry to TETA ushered a wave of unqualified audits, strategic occupational programmes and innovative remedies addressing persistent sectoral challenges. Anno-Frempong, who has also been pioneering the advancement of women in the transport sector into executive roles, says the transport sector is divided into eight sub-sectors according to the country’s skills development framework, and all of those eight sub-sectors have different skills requirements and different needs. “If I look at all of their needs, they are broad, they are varied and all of them are of critical importance for the transport sector to compete favourably with any other country in the world. Without skills development and education, the transport sector would hamper the economy of the country because semi-skilled and unskilled workers are not necessarily productive. We need those skills for global competitiveness and in order to stay ahead of the pack we need skills development. “At this stage we do have skilled people, but I would never say we would get to a stage where there will be enough skills in our sector because the industry is always evolving. We cannot work with the current skills set and hope to go into the future with that.The future requires us to innovate, and for us to innovate we need more skills in different areas of transport. Currently we don’t have enough skilled people in the transport sector, and if we were to try and make sure we have them skilled we would need to do a lot of skills development—and collaborating with a variety of institutions are key to this success,” Anno-Frempong told Achiever. 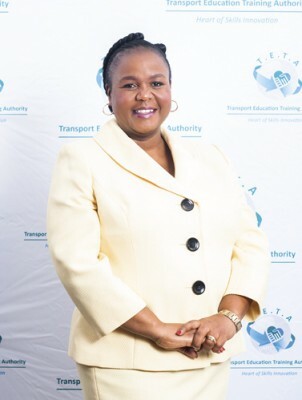 The vision that TETA has adopted for the coming years is to be at the heart of skills innovation in the transport sector in all its learning programme interventions and in the way business is done with the sub-sectors and transport industry as a whole. This mind-set is very important—not just for TETA, but for all other organisations in the transport training space. “To me innovation is when you venture onto unchartered ground. Reaching outside one’s comfort zone can be quite scary, be it a company or new division in the transport sector, or even the SETA, because you’re gunning to be ahead of the pack, and you are always doing new things, always looking for better ways of doing things, and you also allow yourself to take risks. The companies in the world that have done well are those that dare to take risks and don’t do the normal things and expect a different result.” Concentrating on filling the skills gaps in transport, TETA’s role in the industry is essentially to facilitate skills development in three ways. Firstly the organisation undertakes research (a needs analysis), after which it determines what the demand and supplier skills are. Once that has been concluded, it develops qualifications. Anno-Frempong says should they find that there is not a training program offered in any of the higher education institutions, TETA will find subject matter experts to develop that qualification. Once that is done, TETA plays a quality assurance role. Looking at current trends in nurturing those skills, especially in remote areas or places situated away far away from the cities, TETA has, in its 15 years existence, realised that in order to increase skills levels, it had to also look at other provinces that might not have a transport presence like the bigger commercial provinces such as Gauteng, the Western Cape and KZN. “Another initiative that we have been involved with is supporting small, medium and micro enterprises with skills development. The most recent innovative initiative was to help the taxi industry to diversify and focus on other areas of transport other than just passengers. “In the daytime, when the passenger transport business is not that busy, we have suggested that taxi’s utilise that time to do express parcel delivery. We have worked with SANTACU and some other taxi organisations in this regard.” Anno-Frempong says the list of skills critically lacking in the transport sector is long and includes the expertise of mechanical engineers, diesel mechanics, transportation electricians, supply and distribution managers, engineers for vessels or ships, electrical engineers, logistic managers, mechanical engineering technicians, drivers of all types, facilities managers and operators. Today it’s a fact that, due to the establishment of TETA as a tool to bridge the skills gap in transport, positive results have been achieved. “Our statistical analysis of the different programmes that we have run over the years indicates that our trend analysis graph is curving upwards. There is bigger interest and our success rate is quite high. We’ve done two tracer studies and the one has shown us that when we train people, their chances of getting a job are higher, and their chances of improving their salaries are higher. Our programs are actually beneficial for them individually and for the companies they work for. “I have also noticed that most prospective managers going for an international program in leadership get promoted after participation. We would like to believe it is because they have acquired more skills and are more competent,” says the CEO, who has also been championing the introduction of two strategic occupational programmes—the International Leadership Development Programme and the International Executive Development Programme.In conclusion, Anno-Frempong says the transport sector has played a big role in the economy of South Africa. One just has to look at the country’s gross domestic product—the transport sector contributes 9% to the gross domestic product of the country. In 2012 the transport sector revenue was R242 billion and by 2015 it increased to R256 billion, and the transport sector contributes 6% of our workers in the country.